When we left Marmaris, I wanted a souvenir to take with with me. I thought about it. Did I want something from the Pazar? Did I want a copper tea pot? Did I want some jewelry? No. I thought long an hard, and I made the right decision. Honey. 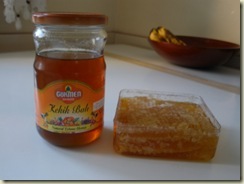 Marmaris is known for its honey. I was able to score some of the seasonal Thyme Honey. It is fantastic, it has a tangy, distinct flavor and is just amazing. It adds such a lovely flavor to tea, and even is very tasty eaten right out of the jar. ( I really like honey) I also scored some wildflower honeycomb honey. When I am feeling indulgent, there is nothing better than fresh warm bread, with a little butter and a generous layer of the flower honey. I have had to step up the work out regime to offset the honey consumption but it has been worth it. This entry was posted in Expat, Honey, Marmaris, Souvenir, Turkey and tagged Expat, Turkey by Jules. Bookmark the permalink.